A discount of just over 15% is offered bringing the price down to £75. To obtain the discount send an Email claim to nannymonitoruk@gmail.com and you will be sent a code to obtain the discount when booking through the web site. 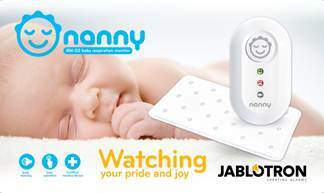 The Nanny baby breathing Monitor produced by Jablotron Alarms in the Czech Republic is the only baby alarm certified as a Medical Device in Europe. The device works using 2 AA batteries not mains power. It is designed to go under the mattress. There is a 2 year guarantee on the product.